These days, leading ministry may be compared to the Thanksgiving meal we are all anticipating. We get a plate and start loading it up. When we run out of room, we get a bigger plate. If that plate proves to be inadequate, just grab the turkey platter! Ministry leaders regularly fill their leadership plates with duties, responsibilities and expectations. When the plate gets overloaded, we generally try to increase the capacity of our leadership plate. This approach can become a dangerous trap! Too many ministry leaders have been victimized by the inability to say no to opportunities. A very frequent self description by ministry leaders is: overwhelmed! Rather than grabbing an even more massive leadership platter, may I suggest we exercise some discretion? Learn to say “no” to some of the items being offered. Keep your favorites, but let some other things go. Find some responsibilities you can release – to someone who perhaps can do them even better than you. While these opportunities are important and you may love them, adding them to an already full plate can make you sick – literally. Don’t let your ministry “eyes” be bigger than your ministry “stomach.” Be balanced, plan ahead, and be reasonable. Unless you are a competitive eater, Thanksgiving will result in satisfaction and gratitude. If you have no restraint, you may find yourself enjoying a food coma. Ministry leader, use restraint. Don’t get overwhelmed. Don’t allow the pressures of your calling and the expectations of others to overload your ministry plate. No one else can do this for you; you must take ownership of your ministry plate. Are you an overwhelmed leader? You’d better take control! Your discipline will result in healthy productivity! I purposefully hyphenated the word discouraged. So, a person who is discouraged is the opposite of courageous. Perhaps not cowardly, but certainly far from brave. Unfortunately, this describes many leaders I know. Confidence eludes them. Optimism is a million miles away. Is this because they are poor leaders? I don’t think so. I think the source of discouragement is much deeper than a performance consideration. But rather than dig into the cause of discouragement for leaders, I want to spend a moment exploring reasons to be encouraged. You see only with your eyes. The true measure of your work is probably unseen physically but it is revealed spiritually. In other words, you don’t know the good you are accomplishing. Don’t get too down over a lack of measurable progress. I think you are having a greater impact that you realize. You are not called to be successful in the eyes of the world; you are called to be faithful to your God. Our culture measures success by the amount of money and fame we possess. Like the weather, these things can change in a moment. God defines success by faithfulness. You’ll never be a celebrity, but you will be rewarded for obeying the Lord – whether or not you are famous. You are not alone. Leading is the loneliest job in the world and sometimes the solitude can result in discouragement. Jesus has promised to be with you to the very end. And you have colleagues who care about you. Maybe they are too busy to let you know, but you are important to them. And by the way, don’t be too busy to check in on your leader-friends. Your discouragement can actually become a tool to help others. Most of the people you lead are currently dealing with a similar issue. They are looking for a way through the puzzle. Who better to lead them than one who has recently escaped from the maze of discouragement? If you stay stuck in the trap of being downcast, they will stay stuck with you. Lead yourself and others out of the cloud of discouragement. Your hard work and dedication will eventually pay off. One of the sources of discouragement is fatigue. We simply get tired of pushing the rock up the hill with no end in sight. Anybody can be happy when everything is going well. But true leaders have to forge ahead against the wind and in the face of lots of opposition. This can wear you down. But please be aware that the investments you are making now will have big results. It is a spiritual law that cannot be broken – you reap what you sow. If you will be faithful, even in the little things, God will multiply it. One day, when the journey is finished, I believe that you will receive the ultimate affirmation. The Scriptures tell us that, if we remain faithful, we will stand before the Lord and will hear His words: “Well done good and faithful servant. You have been faithful in the small things, I will make you ruler over many things. Enter in to the joy of the Lord!” How awesome is that? While you may not see the finish line, it’s close. Don’t give up! Rather than offer a lot of spiritual-sounding clichés, here is something practical: It’s the leaders in the world who make things happen. It’s not easy (it if was, everyone would do it!). If you are compelled to be a leader, you must lead. The only other option is quitting and then you become part of the problem rather than part of the solution. Steel yourself; prepare your heart. Strengthen your backbone. Develop greater courage. And if you need help with this, reach out to another leader. They get what you’re going through. Dis-Couraged Leader, encourage yourself! Lead on! Experience should make your job easier. I am not finding that to be the case. The older I get and the more time I spend in Christian ministry, the more challenging it seems to become. Monumental shifts in our cultural contexts leave the church in unfamiliar territory. While we once enjoyed the favor and respect of the community, we now find ourselves on the receiving end of rejection and even disdain. Worse than being rejected is being ignored. Because the Western culture has, for all practical purposes, abandoned a Christian worldview, churches that adhere to traditional Biblical tenets are dismissed as ignorant or hate-filled. 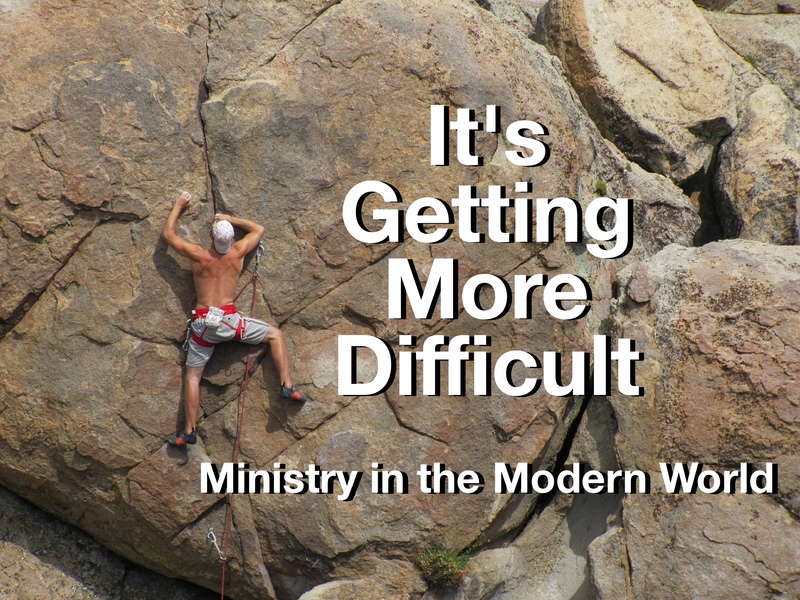 Times are rapidly changing for those in ministry. I have a few suggestions that may enable us to more effectively navigate these tumultuous waters. 2. Maintain proper perspective. While we are experiencing new opposition to our faith, there are countless brothers and sisters around the world who are giving their lives for the sake of the Gospel. 5. Remember, it’s not our fight. Jesus said, “If the world hates you, keep in mind that it hated me first.” (John 15:18) God is well able to take care of His business, don’t make cultural resistance your personal battle. I wish I could tell you that the pressure that ministries face will ease in the near future. I don’t believe that it will; in fact, I believe that it will only get more difficult. I can tell you that our current situation doesn’t catch God by surprise. He remains in control. He has promised to be with us. And He will be victorious in the end. Hang in there, Child of God. Great will be your reward. I had an intriguing meeting yesterday. As part of my administrative responsibilities, I assist pastors and local churches in securing places of worship. One of the churches I serve is considering relocating and we had a meeting with the representative of a major denomination who is selling one of their properties. This gentleman’s task is to liquidate buildings that they no longer plan to use. The congregation that worshipped in the building we are considering disbanded. They had worshipped in that building for 100 years. The stained glass photo is an actual shot from this beautiful old building. That is where the conversation got interesting. This man told me that his denomination is selling all of their buildings where local congregations fail. In essence, he said that they have no plans to bring in new leaders and start new congregations. Church planting and raising up new congregations is “not on the radar.” They will cut their losses and get as much money as possible from the liquidation of the building. 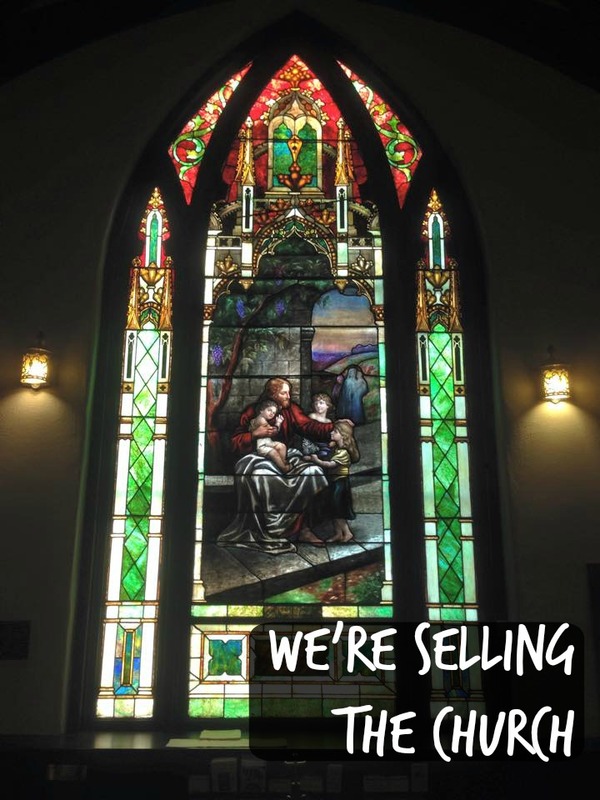 After 100 years, they are selling the church. I was a little stunned by the matter-of-fact way he communicated their approach. I was also a bit shocked that this man could make a living selling church buildings. I wondered how many churches they were closing. Why had they given up on the idea of opening new churches? And I wondered how long they could keep their organizational doors opened by selling off their properties. It’s a matter of math and time until they run out of inventory. And it appears as though the vision of the group has been extinguished. I choose to allow this denomination to remain unnamed. Believe me, you would recognize the name. Way more vital than a relocation consideration for our church is the painful truth that this experience reveals. Many once-strong churches are not surviving. Some denominations are abandoning ship and only trying to keep from losing a lot of money in the process. As a denominational leader, I am concerned about our direction. Is this building liquidation a sign of things to come for the church in America? The true Church is not a building; it is people. But when once-vibrant groups are willing to abandon communities and years of ministry, we have reason for concern. When starting new churches is “not on the radar”, we’d better be worried. I am not concerned about the future of the church; Jesus promised that She would survive. I am concerned about the future of the world. If the church gives up trying, how will the world be saved? 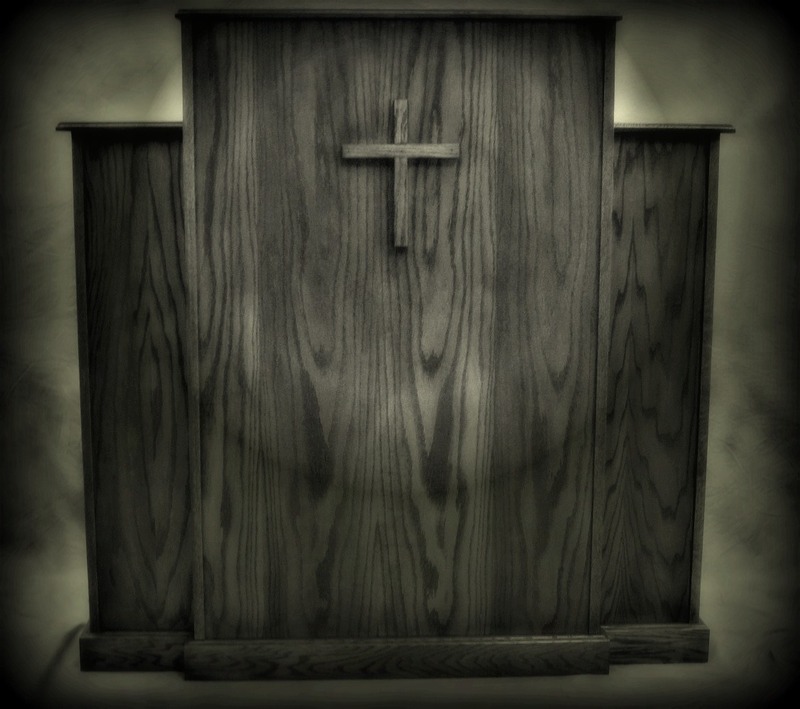 For those who don’t speak churchy language, a “pulpit” is a piece of furniture that is sometimes utilized by preachers in a church. It holds a Bible and is usually placed front and center of the stage or platform. Other names for the pulpit are podium, lectern, or rostrum. Recently, I was involved in a project at a church where we were moving some furniture around. I noticed that the pulpit had a lot of dust on it, mostly around the base at the bottom. Obviously it had been some time since the janitor had given it a cleaning. This is not an indictment of the janitor. In fact, I think those guys are the unsung heroes of most churches. I’ve always said that the best possible pastoral training is to serve as a church janitor for a while. When I saw the dust on the pulpit, it struck me. I thought of what the desk represents: sacredness, purity, preaching the Word of God, the voice of God being heard by the people. But the dust spoke to me of humanness, of failure and of sin. It is ironic that God chooses such imperfect people to represent and communicate His perfection. Some people expect a perfect pulpit (or pastor). There is no tolerance for mistakes. There are too many stories of preachers who have sinned. Although gross immorality happens only in a minority of churches, these stories get a lot of coverage in the press. Truthfully, however, there is proverbial dust on every pulpit. Every pastor has a struggle. To err is human. Regardless of how hard we try, we are covered with dust. Preachers can do the work of God with diligence, yet we are still guilty of sin. This is not an excuse to sin; and be reminded that the standard for Christian leaders is higher than for everyone else (see James 3:1). Pastors, never approach preaching with unconfessed sin in your life. If you are not a pastor, pray for your pastor. But we must be aware that God works in spite of the dust in our lives. We can’t tolerate the dust or accept it as the norm. We’ve got to clean ourselves often. However, part of the wonder of God is that He selects you and me to be His messengers – dust and all. Amazing.